When this card you control is destroyed by battle and sent to your Graveyard, you can add any "T.A.D.P.O.L.E. "(s) from your Deck to your hand. 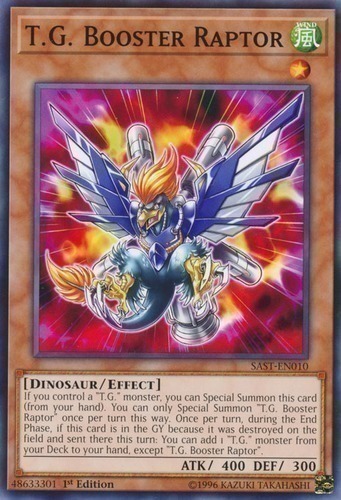 If this card is Normal or Special Summoned: You can target 1 Level 4 or lower "T.G." monster in your GY, except "T.G. Screw Serpent"; Special Summon that monster, but its effects are negated. You can banish this card from your GY, then target 1 "T.G." monster you control; increase or reduce its Level by 1 until the end of this turn. You can only use each effect of "T.G. Screw Serpent" once per turn. 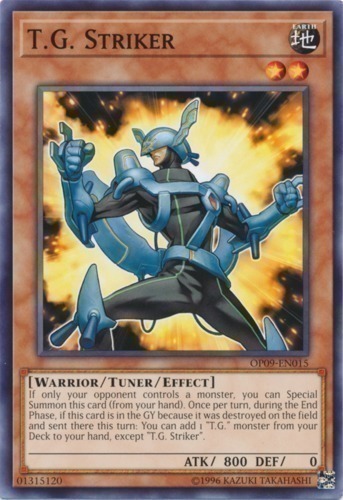 Once per Chain, during your opponent's Main Phase, you can (Quick Effect): Immediately after this effect resolves, Synchro Summon using this card you control. You can only use each of the following effects of "T.G. Star Guardian" once per turn. 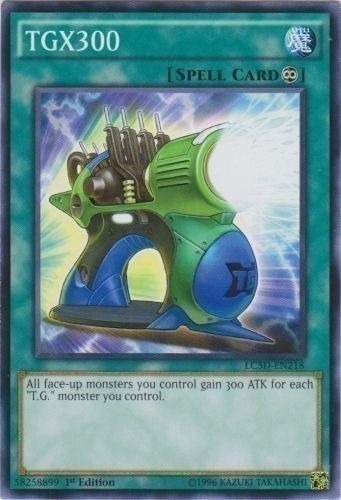 If only your opponent controls a monster, you can Special Summon this card (from your hand). 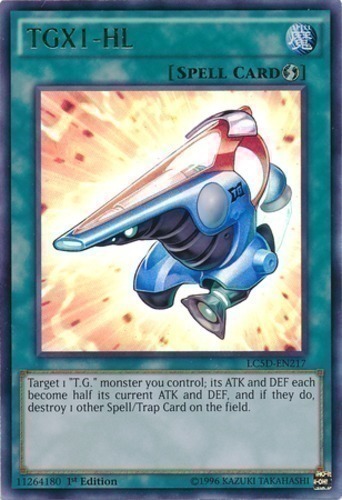 Once per turn, during the End Phase, if this card is in the GY because it was destroyed on the field and sent there this turn: You can add 1 "T.G." monster from your Deck to your hand, except "T.G. Striker". 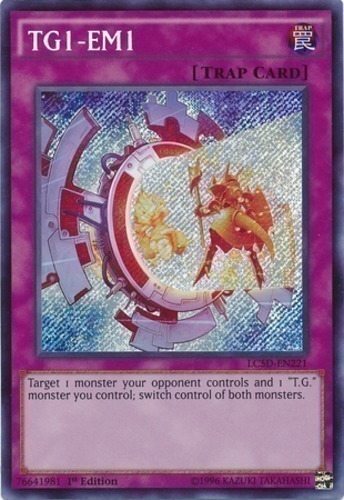 If this card you control is used as Synchro Material for a "T.G." monster, you can treat it as a non-Tuner. If this card is sent to the GY as Synchro Material for a "T.G." monster: You can Special Summon 1 "T.G. Token" (Machine/EARTH/Level 1/ATK 0/DEF 0) in Attack Position. You can only use this effect of "T.G. Tank Grub" once per turn. 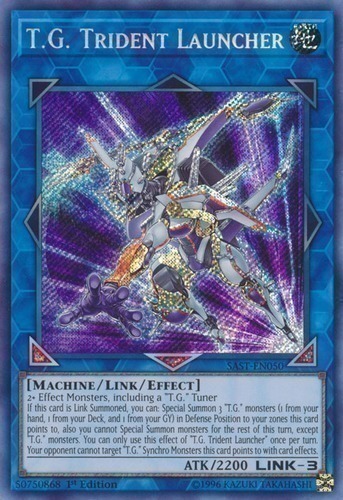 If this card is Link Summoned, you can: Special Summon 3 "T.G." 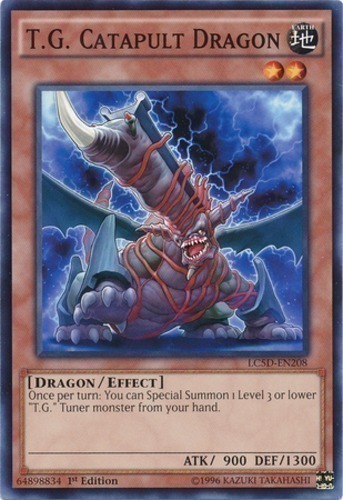 monsters (1 from your hand, 1 from your Deck, and 1 from your GY) in Defense Position to your zones this card points to, also you cannot Special Summon monsters for the rest of this turn, except "T.G." monsters. You can only use this effect of "T.G. Trident Launcher" once per turn. Your opponent cannot target "T.G." 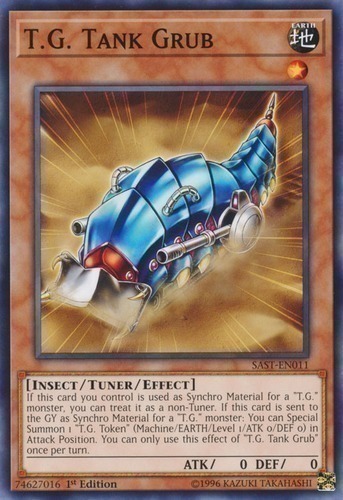 Synchro Monsters this card points to with card effects. 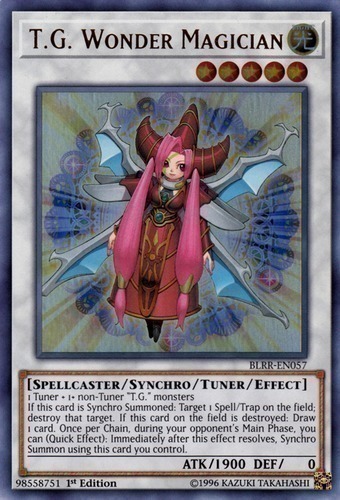 If this card is Synchro Summoned: Target 1 Spell/Trap on the field; destroy that target. If this card on the field is destroyed: Draw 1 card. 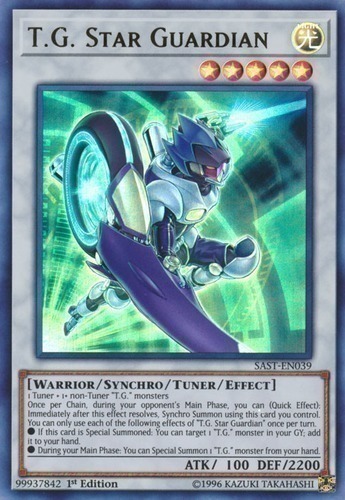 Once per Chain, during your opponent's Main Phase, you can (Quick Effect): Immediately after this effect resolves, Synchro Summon using this card you control. When a "T.G." 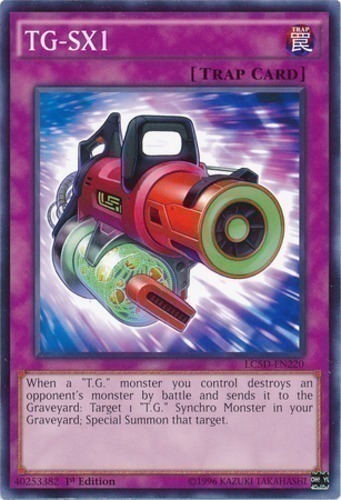 monster you control destroys an opponent's monster by battle and sends it to the Graveyard: Target 1 "T.G." 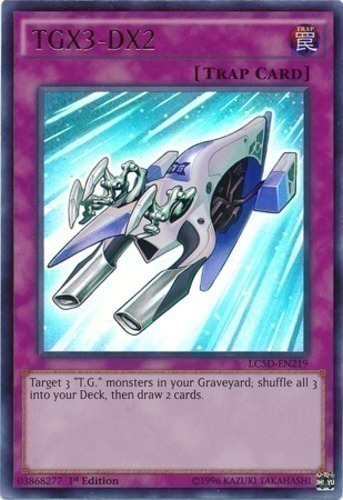 Synchro Monster in your Graveyard; Special Summon that target. Target 1 monster your opponent controls and 1 "T.G." monster you control; switch control of both monsters. Target 1 "T.G." 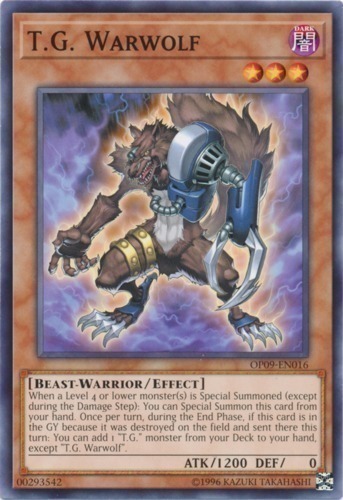 monster you control; its ATK and DEF each become half its current ATK and DEF, and if they do, destroy 1 other Spell/Trap Card on the field. Target 3 "T.G." monsters in your Graveyard; shuffle all 3 into your Deck, then draw 2 cards. All face-up monsters you control gain 300 ATK for each "T.G." monster you control. 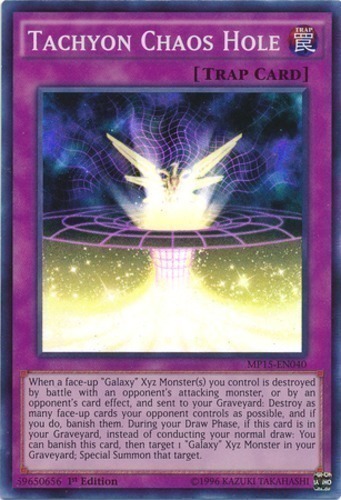 If you control a "Galaxy-Eyes" monster: Negate the activations of your opponent's Spell/Trap Cards and monster effects activated before this card in this Chain, and if you do, shuffle the negated cards on the field into the Deck. 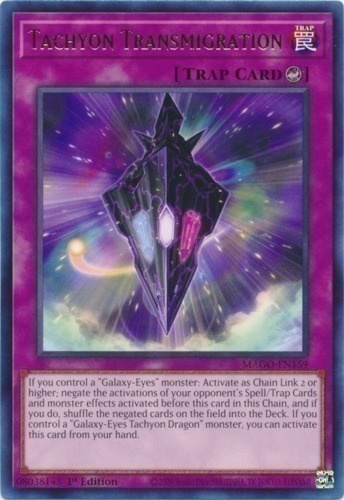 If you control a "Galaxy-Eyes Tachyon Dragon" monster, you can activate this card from your hand.